Apple announced today a new game service, called Apple Arcade. The subscription service offers access to over 100 exclusive new games for a monthly fee. Many of the most influential tech giants are more and more interested in gaming nowadays. Google just announced a game streaming platform called Stadia, and Microsoft, whom of course have long line of Xbox gaming pedigree, are expected to launch xCloud service to rival Google's Stadia at E3 in June. However, Apple's offering is nowhere close to what Google and Microsoft, and even the likes of Sony and OnLive, are attempting. Apple's service is simply a subscription to hand-selected exclusive games on iOS, although you'll be able to play the games on Mac and the Apple TV as well. 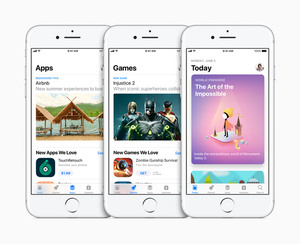 According to the company iOS is the largest gaming platform and the power of over 300,000 games available it's gamer's paradise where over a billion games have been downloaded. Unfortunately it doesn't allow you the access to all of them, unlike some rumored. Even though Apple did show some sneak peak into what will be included in the first 100 or so titles, we don't have a list of games yet. Neither do we know how much Apple Arcade monthly charge will be. What we do know, is that the service will launch in Fall 2019.